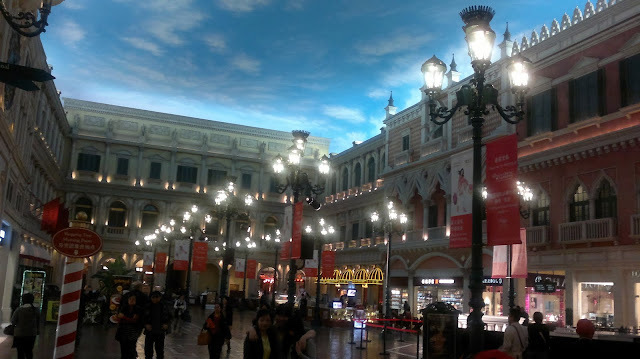 While I went for a week of Hong Kong trip 3 weeks ago, I went to Macau for a day trip with my cousin sister, her mom and my mom. Took the TurboJet from the Hong Kong Macau Port, it takes only 1 hour to reach Macau from Hong Kong. We booked a half day tour guide package, so there is a bus waiting for us in the Macau External Port. If you didn't book a tour, don't worry, there are many shuttle buses from different casino waiting to take you to their hotel. So look at the area you wanted to go to then choose the hotel shuttle bus that you want. It's free of charge. 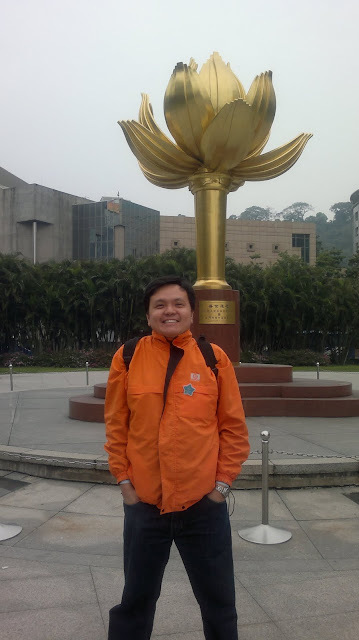 Lotus is the Region Flower of Macau after being handed back to China in 1999. There are a lot of traditional Chinese biscuits souvenir shops here near the Sacred Ruins of St. Paul Church. So be ready to shop lol. The famous landmark in Macau. The Sacred Ruins of St. Pauls Church. The street below The Sacred Ruins is filled with souvenir shops. The same company will have a few shops in one street alone. I still prefer the dried pork in Malaysia. Taste much better. Their biscuit and peanut candy are recommended. These buildings were reconstructed. 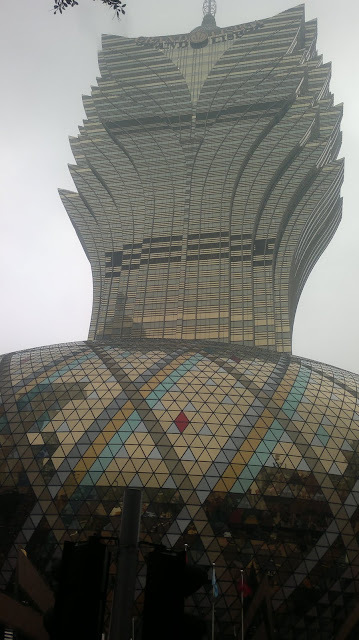 Macau government set the rules that it cannot be higher than three storeys and have to maintain the design. Then we're off to Macau Tower. Have to pay about HKD$120 for entry but our tour package included it, so it's cheaper. 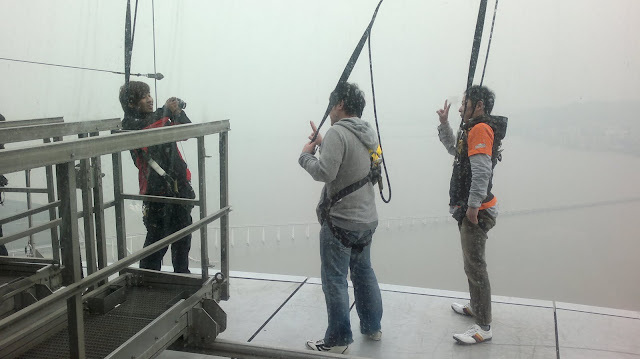 The world highest bungee jumping by AJ Hackett can be found on Macau Tower. 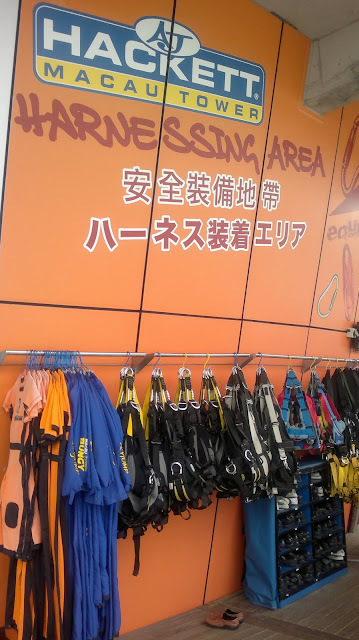 Not brave enough for bungee jumping? Well, you can choose to do tower walking, which means walking outside the Macau Tower. If I have the time I think I will do it lol. 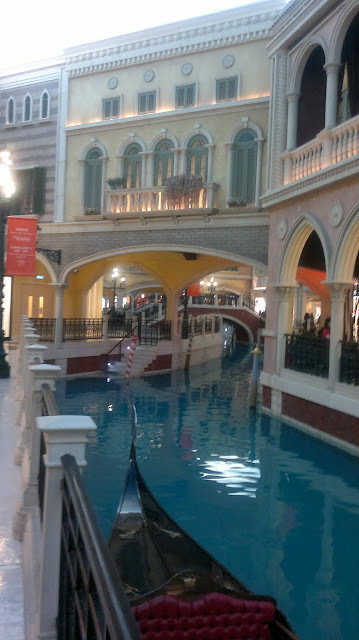 After lunch, our last stop for the tour is The Venetian by Sands. This is a huge resort/casino/shopping mall. Walk until my feet so tire. Sands Marina Bay, Singapore is consider small when compared with The Venetian. After The Venetian, we took the shuttle bus there to Macau External Port and then took the shuttle bust to Lisboa Hotel because we wanted to go to the old street. 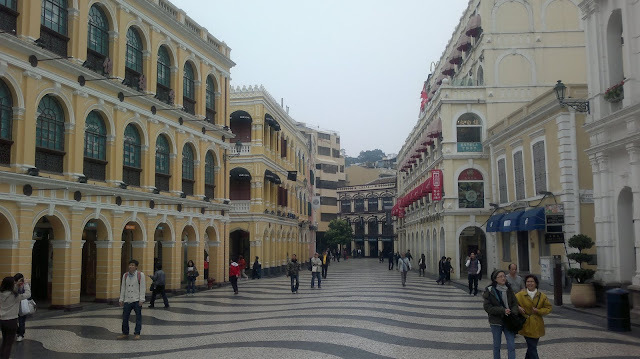 Macau has two part, the Peninsula and Taipa Island. The Venetian is in Taipa Island and Lisboa is in the Peninsula. Opposite Lisboa is the new Grand Lisboa. 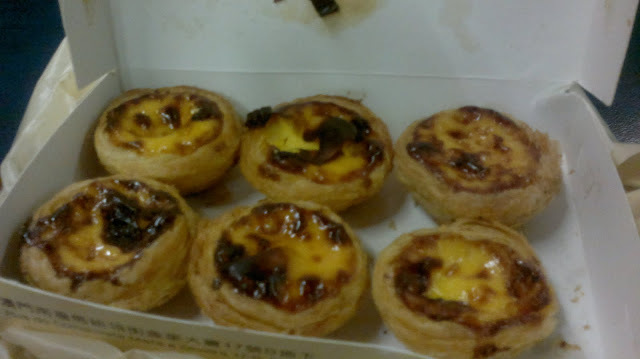 The reason we come here is to look for pork bun and Portuguese tart. 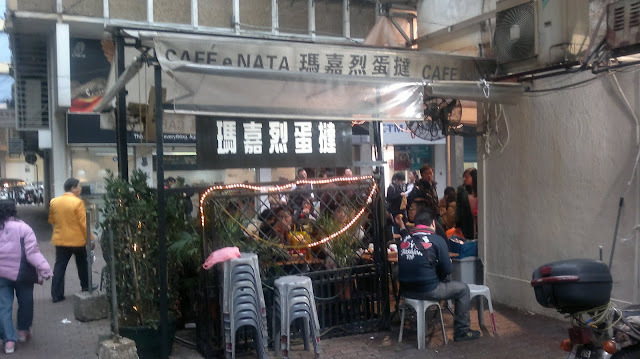 Just a street behind the Grand Lisboa, we found Margaret's Cafe e Nata that is very popular for it's Portuguese Egg Tart. The seats are limited so we decided to take away a dozen egg tarts. There are a lot of customer also having coffee and eating other pastries here like sandwiches. The skin are crusted and crispy and the egg filling is soft and smooth. The sweetness is just nice. The tart cost HKD/MOP $8 per piece. Best to eat it after you bought it. Oh, by the way, Hong Kong Dollar is widely accepted here in Macau, so don't bother to change to MOP if you come from Hong Kong. 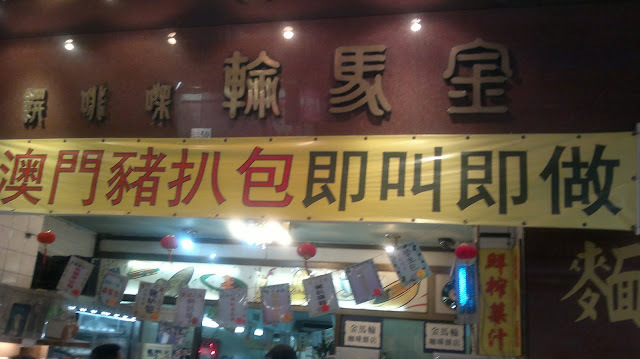 After getting the Portuguese egg tart, it's time to look for pork bun (猪扒包). 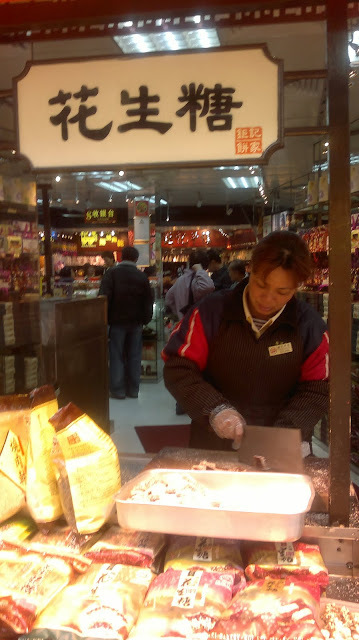 The problem is the most famous pork bun in Macau is in Taipa Island and we sure don't have time to go back there. So, we try to ask the local there and luckily there's this local guy told us to go look for Cafe Kam Ma Lon (金马轮咖啡饼店) a few streets away. 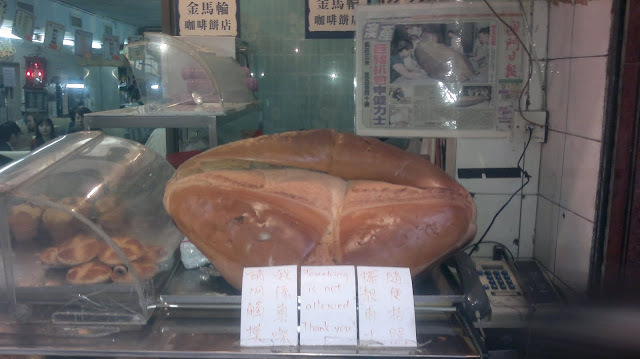 You'll know that you've reach the place when you see this big bun outside the shop. The pork bun here is only prepared when you order. So, it's fresh. The pork chop is not too bad but nothing to wow about. 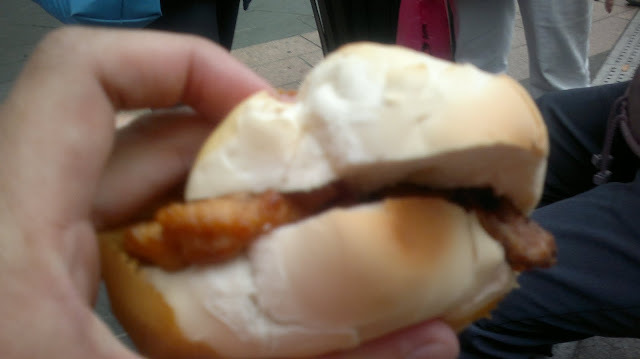 I think it's famous because the bun is really nice. This maybe because it's also pastry shop from the start. Not too bad, a good alternative to the pork bun in Taipa Island. Cost HKD/MOP $16 per piece. After that we took the shuttle bus from Lisboa to get to Macau External Port to take the TurboJet back to Hong Kong. A note to remember, foreigner who come in from Hong Kong will need to have their passport. It is like you are leaving Hong Kong and going to another country, when you come back to Hong Kong, you will have to fill in the immigration form again. 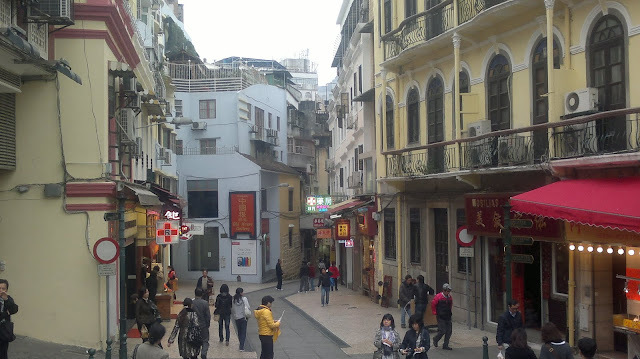 A day is too short to explore the whole of Macau. 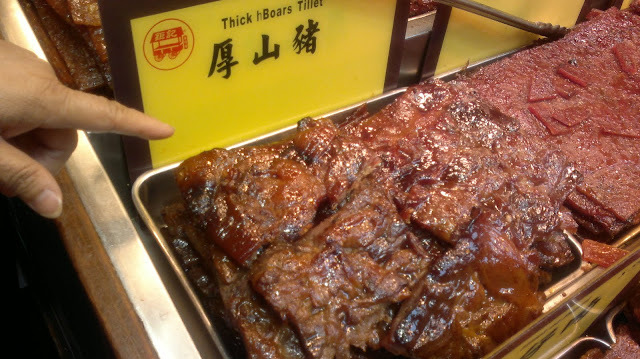 There are many more nice food that I haven't get to try yet in Macau. Well, next time I'll fly straight to Macau and stay for a few days lol. kumfye: Bungee jump? Hahaha, I'm not sure whether I dare or not. Yeah, Macau is quite nice to visit. 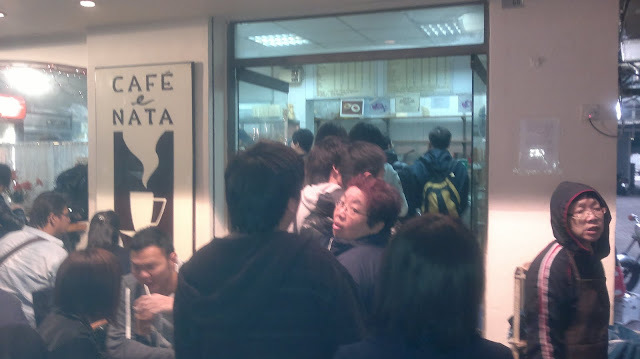 Wow, that's quite a crowd there at cafe e nata. Was at lord stows venetian and it was just a short que. Quirky: oh, Lord Stow, I was there too when I was in Venetian but just ate lunch at that time so didn't buy any egg tart. or cultural sightseeing, our professional and knowledgeable staff is available to make your stay comfortable and memorable. Leave your worries to us and enjoy your holidays in Nepal. 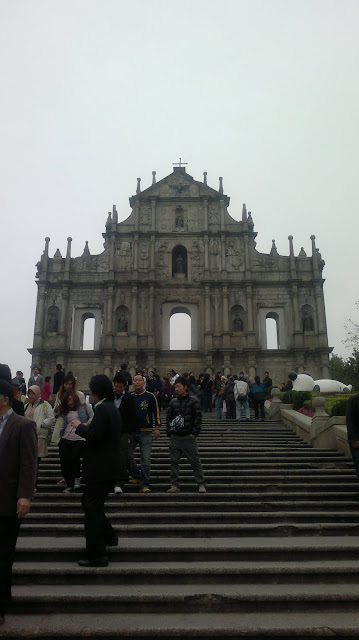 Hi, may I know if you still remember where do you book the half day tour in Macau? hope to get your reply soon. Hope can get your reply soon. Thank you very much..
botanix nature resort Nice post shared man i really enjoyed this post. Adventure Great Himalaya is one of the best government registered Trekking companies in Nepal with qualified and experienced professionals. Adventure Great Himalaya has provided thousands of high quality trekking and tours trips and services for clients from all over the world. If your interest lies in Nepal trekking, Peak climbing, Tours in Nepal and River rafting, cultural sightseeing and luxury tours and treks, our professional and knowledgeable staff are available to make your stay comfortable and memorable. 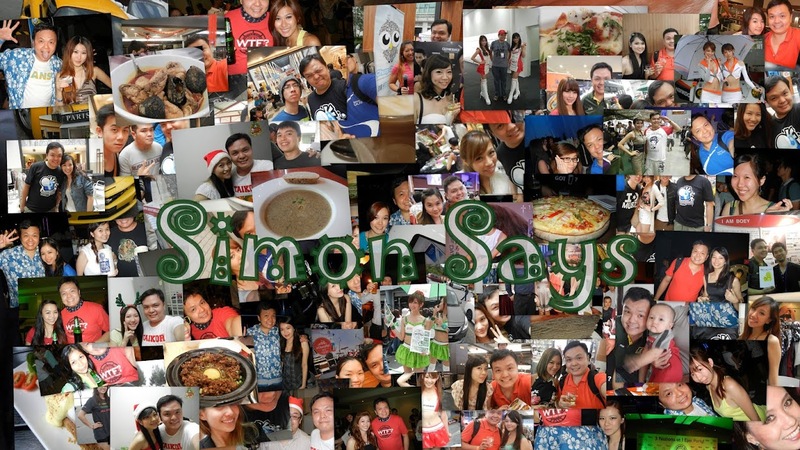 You Might Magically Win A Samsung Galaxy Ace!